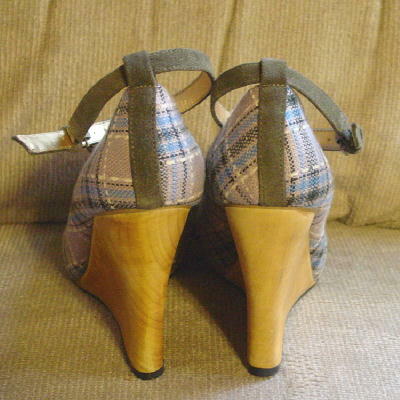 These never-worn wooden wedge heel plaid pumps have ankle straps and rounded toes. They are by Zinc and have dark gold lame linings and insoles. The insoles also have fabric on them. The ankle straps are in a dark olive green and the straps are held in place by a fabric matching exterior heel accent strip. The black soles are manmade. The plaid pattern is in creamy-bone, dark green, black, light blue, and a grayish-sand color. The inner side of the right shoe heel has a line indentation. The shoes have some weight to them because of the wooden heels. She bought two pairs in different sizes for a photo shoot.